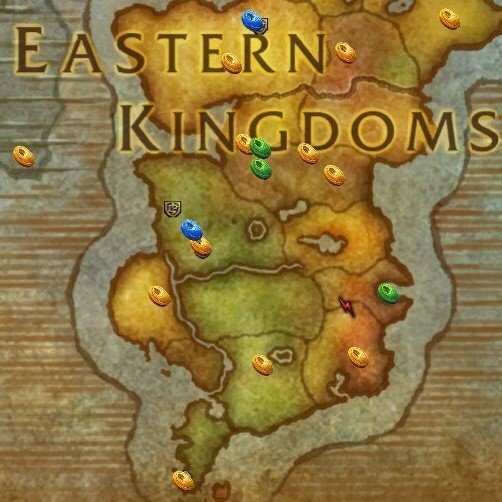 Places pins on the World Map to assist with Achievements from World Events which lead to the What a Long, Strange Trip It's Been meta-achievement for which a gorgeous Violet Proto-Drake is rewarded. Pins may be selectively shown and hidden. World Map "Magnifying Glass" Options: Click the button in the top right of the World Map. Check boxes allow you to show/hide various pin categories, coordinates and completed tasks/quests. 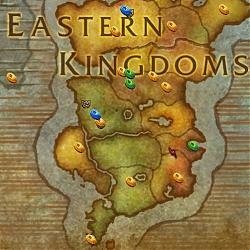 World Map: The sole focus of this AddOn is to display icons on the World Map. Each World Event will have its own icon(s). When you mouse over a pin a Tooltip will be presented. Minimum information will be the event name, location and or NPC name, and coordinates. There might also be useful tips on navigation or encounters. Multiple pins may be shown when navigation or an encounter is difficult. Lunar Festival: Indicated on the maps with a Coin of Ancestry. Players are required to visit various "Elders" scattered across Kalimdor, the Eastern Kingdoms and Northrend. Several of these are located in dungeons or capital cities. Detailed navigation instructions for Maraudon, Blackrock Mountain and Utgarde are included. Note that a character which has previously completed the Elder "quests" may repeat those quests the following year. Visiting all the NPCs marked by this AddOn will net you 8 of the 12 achievements towards To Honor One's Elders. Love is in the Air: Indicated with heart-shaped box pins, thematically colourised! Five locations. Pay particular attention to the Gurubashi Arena tooltip if you wish to complete this leg without being flagged for PvP! Note also that the Arathi Basin pin, located in the Arathi Highlands, requires you to enter the Battleground. The pin merely serves as a helpful "completion" prompt. Repeatable each year. Individual components are shared across all characters each year. * Green Heart Box: for the Nation of adoration (Horde) or Nation of adoration (Alliance) achievement. The quest giver Kwee Q. Peddlefeet is located at each of the four marked locations and you will need to have obtained from him a Lovely Charm Collector's Kit prior to farming "experience yielding" (i.e. "green" or higher) mobs. If you farm more than ten, then you may also complete a daily in another city. "Completed" in this case is for the Achievement criteria and NOT for the daily quest, which resets everyday. This is more useful for players since actually completing all four of these on a daily basis would be a terribly inefficient means of farming love tokens. Note that the NPC adjacent to Kwee Q. Peddlefeet offers a quick Love Token yielding quest. What is not made clear is that most (not all) city NPCs may be sprayed so it is rather trivial. There is no associated Achievement. Unlike the Kwee Q quests, this quest is strictly once per day spread across all four locations but it may be handed in at any of the locations. * Yellow Ribboned Heart Box: Dangerous Love main quest chain and then the Crushing the Corwn daily. Noblegarden: Both factions have four areas where players may hunt for Brightly Coloured Eggs. These eggs serve as tokens and as they accumulate you are able to purchase items, and the achievements flow! By looking for the Spring Fling pins on your World Map, your four areas are effectively identified. Players in general cite Falconwing Square and Dolanaar as the best areas to farm eggs. Keep farming relentlessly as there is a good chance certain purchasable and necessary items will drop anyhow! Following this brief Guide and AddOn will have you at 6 of 8 for Noble Gardener. Zidormi: In certain zones, due to storyline phasing, NPCs necessary to World Event achievements are not visible. You must visit Zidormi and ask her to "time travel" you. She appears as a red "lightning bolt" on the World Map in affected zones. Other World Events / Configuration options: Coming soon. v1.06 is complete up to and including Noble Garden. More will follow! * Added coordinates for the "Follow the Recipe" daily and capitalised "you"
* "Nation of Adoration" for Horde was using the Alliance Achievement ID - cut and paste error. Doh! * Elder Skychaser tip changed to respect the guards more! Thanks for creating this addon. It is looking better and better with each revision. Thanks a lot. Yeah, trying to stick to the general theme of World Map pin placement. I know players don’t really need help finding Razor Hill for example but I do show Achievement completion which is something when you are frantically farming with limited time across multiple characters. And throwing in some tips and tricks in the tool tips too. I noticed a small misplacement of a Mulgore/Thunderbluff pin in Durotar. Will be corrected in the next release. Also an Elder I think it was in Feralas has an extra name prefix of "High" left over from my cut and pastes. Any other typos or downright programming errors or improvements please let me know. Next version is well underway. Last edited by Taraezor : 02-08-19 at 04:24 AM.